Our CB&O crew has grown quite fond of their time spent with the students involved with Squash Haven. A few times a year, their awesome energy goes toward helping out in various community gardens and other outdoor projects. Our most recent service event with Squash Haven was spent at the Stevens Street Community Garden, working with one of the gardeners to plant tomatoes, lay down newspaper and mulch to combat weeds, and do some digging and other general clean-up. A lot of great work was accomplished! A special shout-out goes to Catherine Monahan who has been a service coordinator with Squash Haven who we’ve worked closely with for a number of volunteer events. This event was Catherine’s last with us as she is getting ready to start a new internship with the Massaro Community Farm in Woodbridge, CT, before a big move out west to California. Best of luck, Catherine! 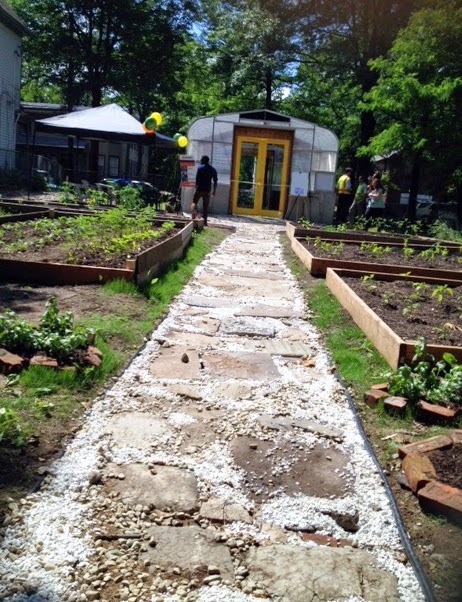 The International Festival of Arts and Ideas "Gardens and Green Houses" bike tour stopped at the newly completed Ivy Street Community Garden Greenhouse this past Saturday, June 21st. 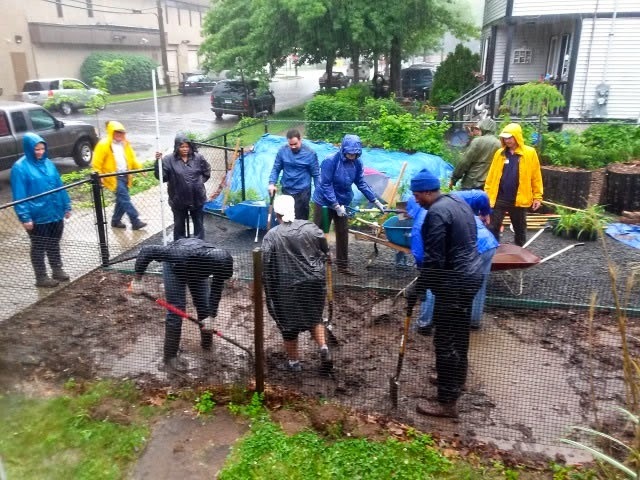 The Varick Memorial Church group also visited the Ivy Street Community Garden over the weekend to help our staff members organize building materials, plant sunflowers and grass seed, and clean up. Ivy Street Community Gardeners, City of New Haven's Livable City Initiative, the New Haven Land Trust, Lincoln-Bassett School, Solar Youth, Fernando Pastor [SEEDnh], and Common Ground High School. We want to thank the United Way of Greater New Haven and the Walsh Construction Company—PCL Joint Venture II for coordinating and providing the foundation for the greenhouse. We would also like to recognize Lior Excavating LLC, the Construction Workforce Initiative 2, Revelation Enterprise, and Extreme Building and Remodeling LLC for lending their time and skills to complete the excavation and construction of the greenhouse. This was a true community collaboration! The greenhouse is open for the season! 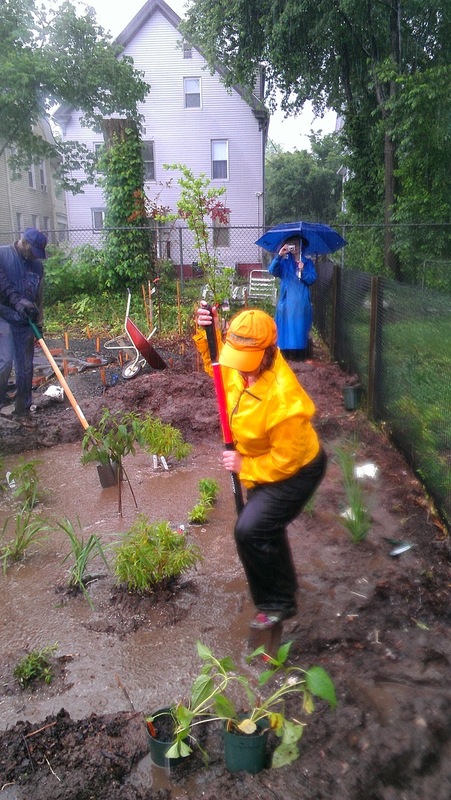 Who would have thought so much work could continue to be done at a community garden?! As a big help to the Ivy Street Garden Greenhouse committee members and its resident gardeners, managers and staff of various Wells Fargo branches joined us for the day to accomplish a lot of work in preparation for the grand opening of the greenhouse. The big project, involving some significant heavy lifting, was completing the stone/rubble pathway from greenhouse entrance to future shed. 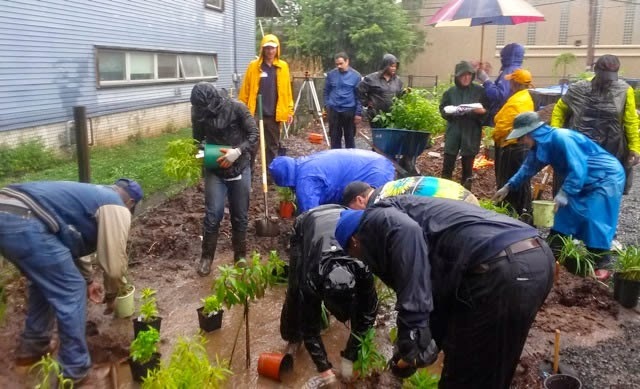 Meanwhile, others worked to accomplish relocating compost and soil, perform last-minute landscaping and litter removal, and some painting on the fence of the garden’s neighbor, Ms. Ida Felder’s house. 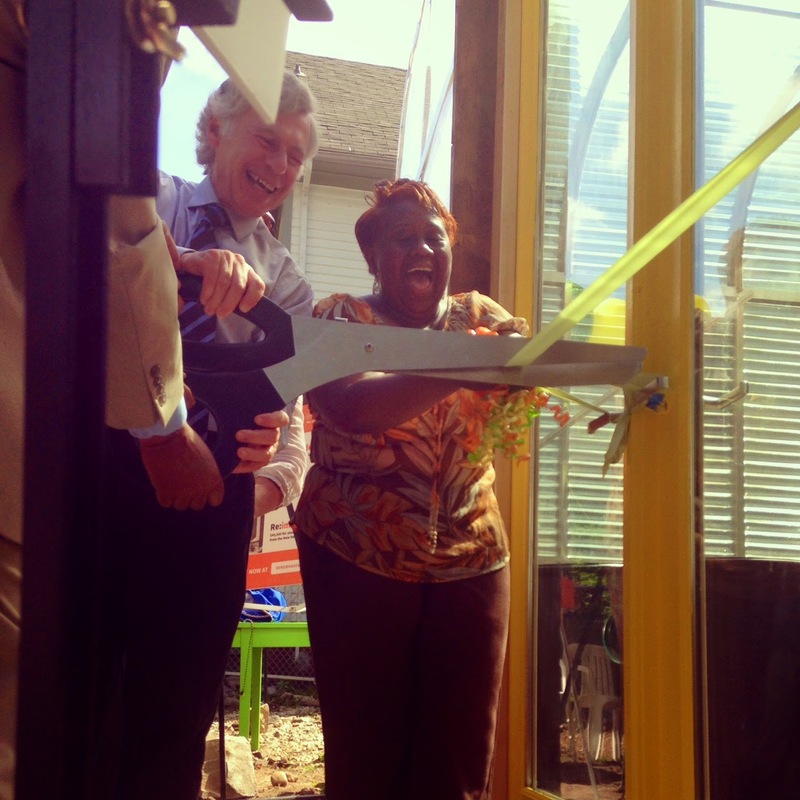 We celebrated National NeighborWorks Week from June 7-15! 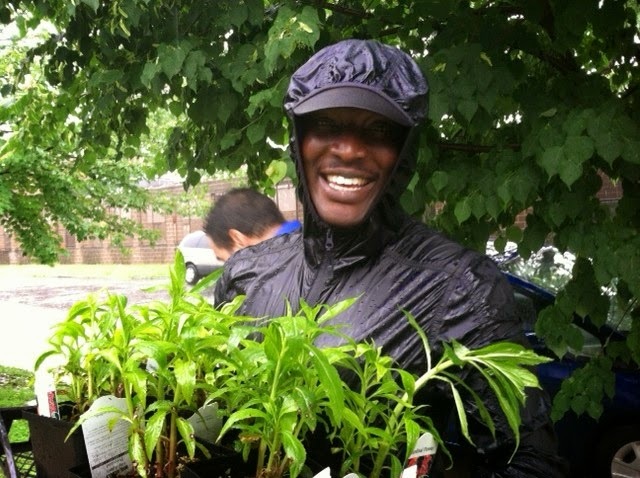 During this week, our partner organizations in the NeighborWorks network organized volunteer events within their communities to invoke positive change. ...and cleaned up litter along the Farmington Canal Trail. We ended the day's activities with a celebratory barbeque! Thank you to everyone who joined us for this year's NeighborWorks Week activities! On Friday, June 13th, we offered a residential rain garden class to teach people about the role of rain gardens in controlling storm water runoff. Besides alleviating water runoff, rain gardens can also be a beautiful addition to your landscape! 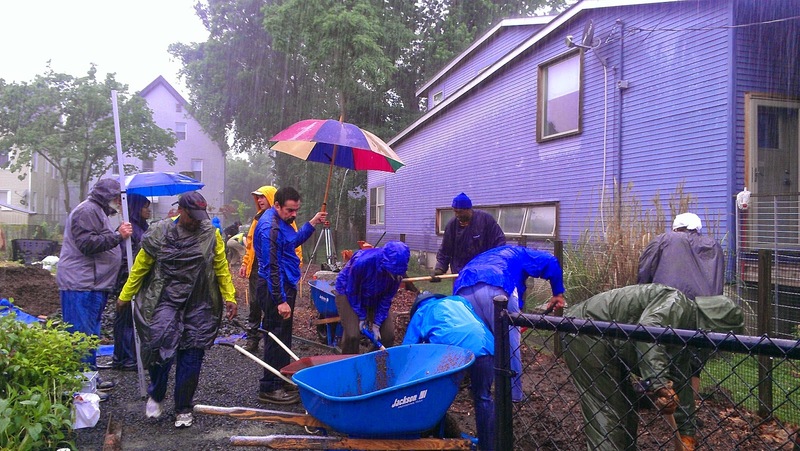 And what better way to learn about rain gardens than in the rain? Kudos to all of our dedicated participants! This class series was made possible by the Greater New Haven Green Fund. The indoor component of the workshop - learning about the history of combined sewer overflows (CSOs), contamination of water, the effects of urbanization on water sources, and more. Rain in the rain garden. 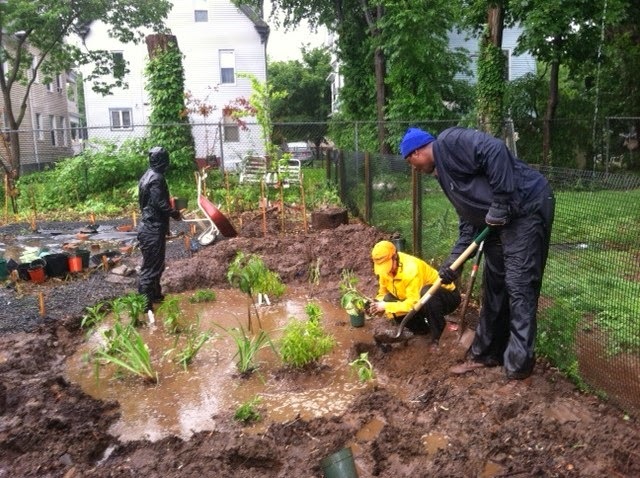 NHS VISTA Member Kim Ochilo was willing to weather the storm to learn about creating a rain garden. Ever wonder what the best way to tackle a ton a laborious, but creative, gardening and building work might be? Senior high school students are one great way! We’ve certainly learned how much we can count on students and teachers from Hopkins School. They joined us for four full days, three of which were spent in the sun and heat at the Ivy Street Community Garden, and one indoors (mainly) at our office during some heavy rain. Committee members and resident gardeners for the Ivy Street Community Garden are so thankful to have had this energetic and hard working group to accomplish quite a list of tasks. 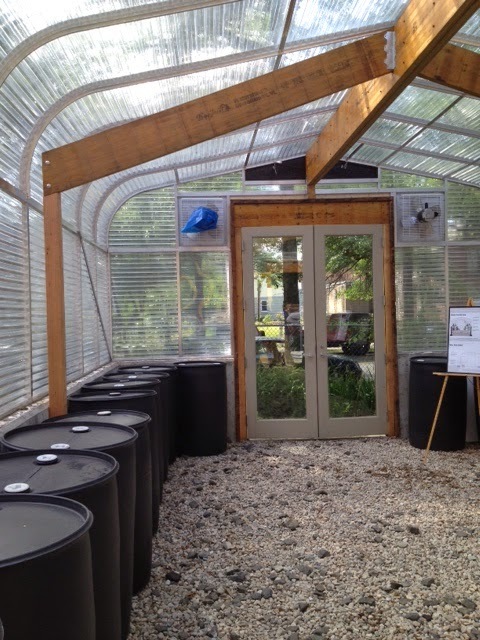 One project involved making use of rubble and crushed foundation that was unearthed during the construction process for the greenhouse. After digging a 4’ wide by 60’ trench stretching from the eastern entrance of the greenhouse to where a shed will soon be located, large, medium and small stone were cleverly arranged and filled in with gravel to begin the creation of a pathway. And this was no easy task! It took a lot of hands and strength to move around some large pieces of concrete. Other accomplished tasks included more heavy lifting to build a stone wall along the Shelton Avenue side of the garden to establish a flower bed and allow for seating in the open and shaded green space of the garden. A lot of leaf raking was tackled along with much needed weeding and cutting down of overgrown tree branches. There was also planting of various vegetables in raised beds that fellow students worked to turn over the soil and add composting to. Furthermore, the garden’s neighbor, Ms. Ida Felder, received some helping hands to clear out leaves, dead plants and debris from her backyard. Whole sections the area were completely transformed by the end of the four days, all with the supervision and help of the gardeners. The most creative aspect of this service week involved the creation of garden sculptures. As a way to utilize plastic and metal materials that had also been found or dug out from the ground, such as pipes, rods, and broken gardening tools, students were asked to experiment with fittings and paint to create sculptures that could occupy a shaded portion of the garden. The students took to the task very well and came up with some truly captivating pieces. Great job, everyone!